﻿DMK believes that the origin of most skin conditions is a result of disharmony within the skin. Using the principles of biochemistry, DMK has formulated a range of treatments and products designed to educate skin to perform like youthful healthy skin. By matching formulations with the body’s chemistry, the skin is encouraged to respond in a positive manner. 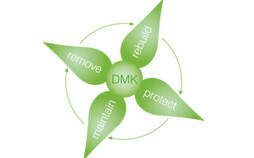 DMK’s revolutionary concept of REMOVE, REBUILD, PROTECT, MAINTAIN aims to match an individual’s biochemistry with the appropriate skin therapy. Botanical-based paramedical products make up the DMK skin care program. “It has been my lifelong quest to create techniques and products that help maintain a youthful appearance” Danné Montague-King. When the young Danné Montague-King sought a solution for his severe acne, he had little idea that it would result in a global skin care empire across thirty countries, rebuilding skin and changing lives all over the world. For more than forty years Danné Montague-King has distinguished himself as a pioneer in the field of skin and body treatments. Danné’s unique vision was to create a skin revision system which reflected nature. Like a complete ecosystem, DMK Treatments and products provide skin cells with chemistry that they recognise. It’s a system which, quite simply, makes sense. As one of the skin care industry’s leading minds, Danné has never been afraid to debate potentially contentious issues which surround the beauty industry or to dispel commonly held myths. Always searching for better ingredients and formulations, he works closely with scientists and invests heavily in research. DMK is the beauty professional’s product of choice. For those whose business depends on generating real results, DMK’s counterintuitive approach to skin care has become a necessity. Hundreds of salons, surgeries and even industry pundits have become converts to the DMK concept. However, the most rewarding accolades are from the hundreds of thousands of people whose lives have been changed forever. ​Hydradermaze is an advanced treatment program designed to help clear acne and congestion. Performed fortnightly for 12 weeks, Hydradermaze addresses the causal factors involved in the pathophysiology of acne. ​Firm, tighten and brighten your skin instantly with the DMK special occasion treatment. ​The perfect accessory for a wedding or party!